A Scottish leader fights for independence for himself and his people. Mel Gibson (who also won the Oscar for direction). Mel Gibson is one of the most popular actors in the world. 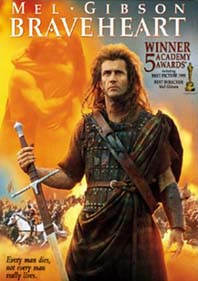 The fact that he had only one film, the low budget "The Man with No Face," under his belt before helming the epic "Braveheart" makes the result of his efforts all the more impressive. Alan Ladd, Jr., son of the famous actor Alan Ladd has been a successful producer for years, including such films as "Outland." He formerly was president of The Ladd Company.